Oana Georgiana (Georgie) is an underwriting assistant in our treaty team with responsibility for risk review, programme modeling and administration of accounts and claims across marine, energy, aviation and non-marine. 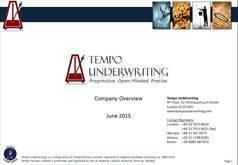 Georgie joined Tempo in 2015 from Omniasig in Romania, a subsidiary of Vienna Insurance Group, where she spent 11 years. At Omniasig, Georgie’s most recent roles included corporate underwriter, business analyst and insurance inspector. Georgie completed a business degree in 2009 at the Romanian-American University with a specialisation in Internal and International Commercial, Financial and Banking Relations. Georgie speaks Romanian and English and is working towards her ACII.